I am enraptured with the golden hour every day from my new home! The sky seems to be a different colour here in South Africa as the light projects in an alternative contrast to the big Australian skies. Why is it that even though you have seen the sunset more times than you can count there is this compelling force that makes you look…? Like flashes of lightning or the site of a rainbow, you simply cannot refrain from taking them in. Perhaps because the golden hour comes with the knowledge it is always unique, never to be repeated in exactly the same way, and is therefore something magical to enjoy as one of those lucky enough to see it. Recently I have had the pleasure of soaking up the golden sunset every evening down by the beach and I must keep reminding myself that staring at the sun, particularly through a camera lens, is not good for ones retina’s even though it is amazingly soothing for the soul. So do watch yourself when its beauty compels you to look and try to keep your vision off centre! Last match of the day. I have been out and about soaking up as much of the incredible Australian outdoors as I can as the count down to departure gets ever closer! A very special place in Victoria and the furthest southerly point of this big red land is known as Wilsons Promontory. I have just had the pleasure of staying down there for a long weekend on my mission to make the most of the bush. It really is a glorious part of the world and seriously worth a visit if you can. There are a wide variety of places to stay in this area and as the accommodation within the prom itself is extremely well sought after, especially during summer, it is not always easy to acquire so I stayed further west in another stunning spot called Venus Bay. This area is also home to an amazing diversity of eco systems with varied temperatures and land types from the beach front to the wetlands behind. Some one who knows all too well about this and the importance of preserving its native life is a lady called Mae who runs the Venus Bay Eco Retreat. 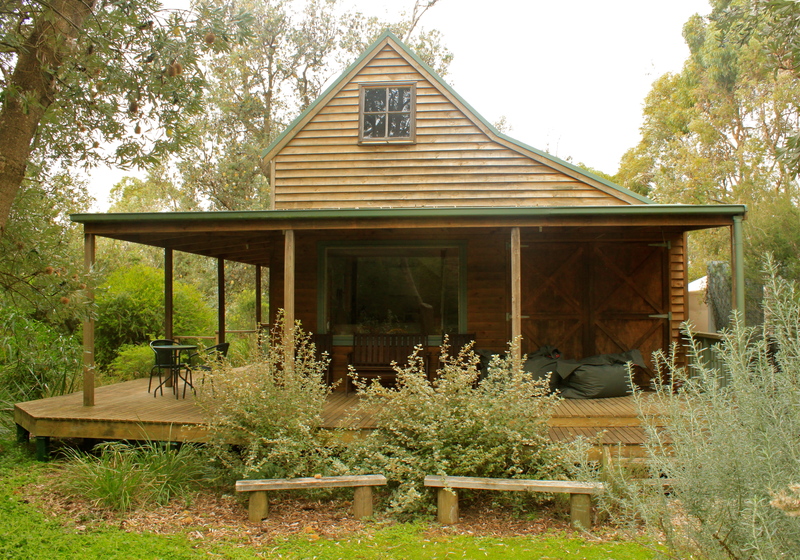 Well what a joy it was to stay in her fabulous Correa Cabin which was full of hidden surprises and local treats, from delicious home-made plum and ginger chutney and tasty preserved fig jam, to soothing organic bathroom products. The tranquil setting makes this a very special place where you can forget all about the hustle and bustle of city life as you listen to the sound of the crashing ocean, the wind blowing gently in the trees and all manner of chatter from the birds and wildlife. From here it is possible to simply walk from the front door and explore. You might even come face to face with a kangaroo or a wallaby as you stroll through the wonderful array of trees and listen to the different songs of numerous beautiful birds. In fact I met many Australian characters on this trip and even had a visit from a certain kangaroo who came to check me out through the floor to ceiling window in the bathroom as I bathed. I am not sure which one of us got the biggest surprise! To get to the “Prom” itself it is about a forty minute drive and one well worth taking. Be sure to drive carefully though, especially at dawn or dusk when the wildlife are most active; to be honest it is best to stay off the road during this time. The landscape is breathtakingly beautiful from the coastline to the mountains to the wilderness and woodlands. There is just so much to discover and I am going to leave that for you to do yourself when you visit. Weekly Photo Challenge: From Above. I certainly saw Fiji from above when I went for a wonderfully tranquil and breathtaking parasailing trip back in 2011. It is a great experience, so long as you are not afraid of heights! You can flail your feet out in front of you whilst taking in the amazing perspective of looking at the landscape as if you are a bird! The motorboat is so far down below the sound of the engine disappears and you are left floating along in awe and feeling pretty much on top of the world! Spread a little magic with the weekly photo challenge.